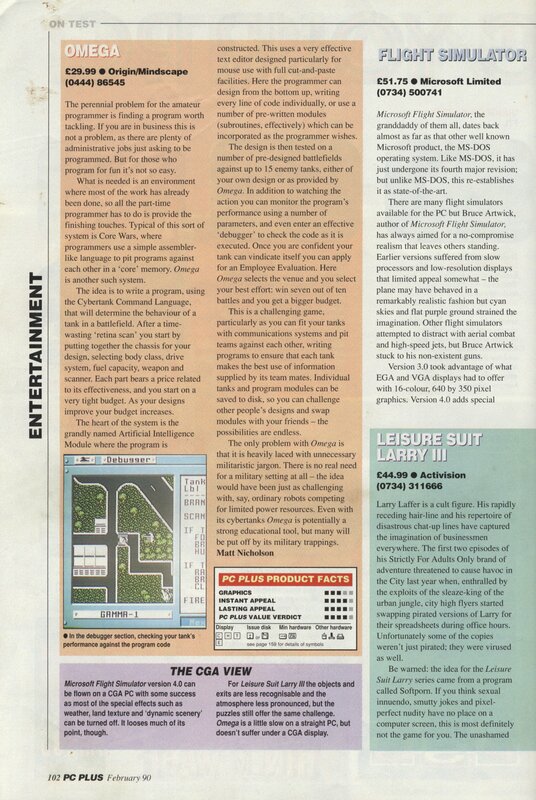 This is a review of Omega from the February 1990 PC Plus magazine. The reviewer was positive about the game in general but must have been something of a pacifist as he didn’t like the warmongering concept. While I’m on Omega, I’ve uploaded a scan of the lengthy Cybertank Engineer’s Handbook from the game. I scanned this for replacementdocs years back but couldn’t do a decent job without a book scanner. By the time they had compressed it down, it was more or less illegible. The new scan is much improved and in the downloads for anyone who wants it. I should also mention the sell off of Origin bits and pieces that Rhea Shelly (ex Origin QA) is having as posted on wcnews.com. There isn’t anything on there I wouldn’t want in all honesty, although I’ll be confining my bids to a select few items to give myself a slim chance of actually winning something. I was hoping to see Caverns Of Callisto among all those early games but no such luck. This entry was posted in Magazine Scans, Omega by Pix. Bookmark the permalink.